The Philadelphia Phillies honored Victorino during a pre-game ceremony on August 3 at Citizens Bank Park, presenting him with this one-of-a-kind painting as recognition of his All-Star Phillies career. 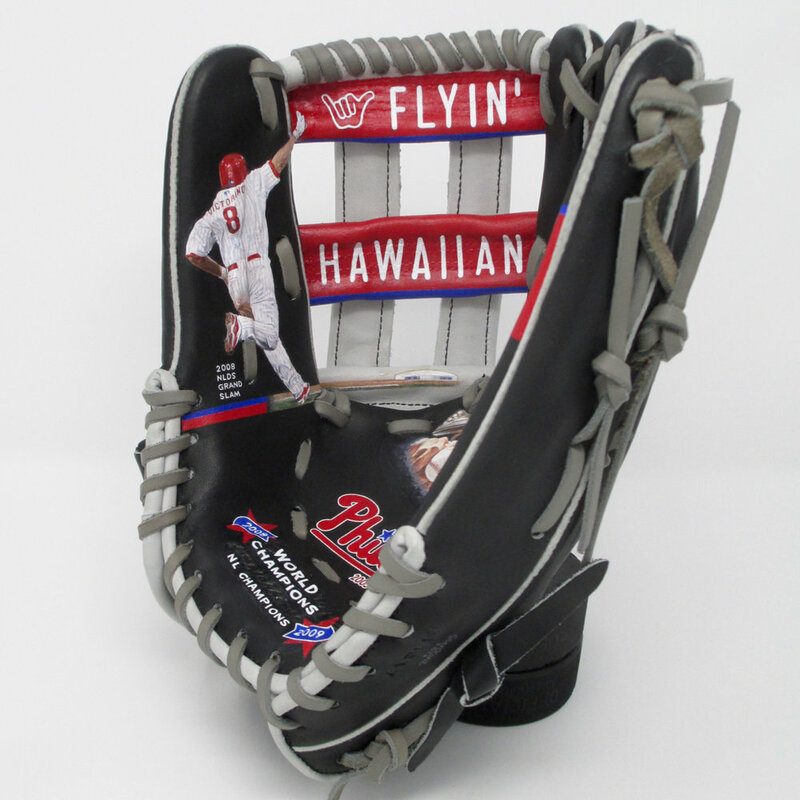 The "Flyin' Hawaiian", a two-time All-Star, won three NL Gold Glove Awards over eight seasons in Philly and was part of their 2008 Championship team. Shane's celebration after hitting his pivotal grand slam in Game 2 of the 2008 NL Division Series is featured, too. 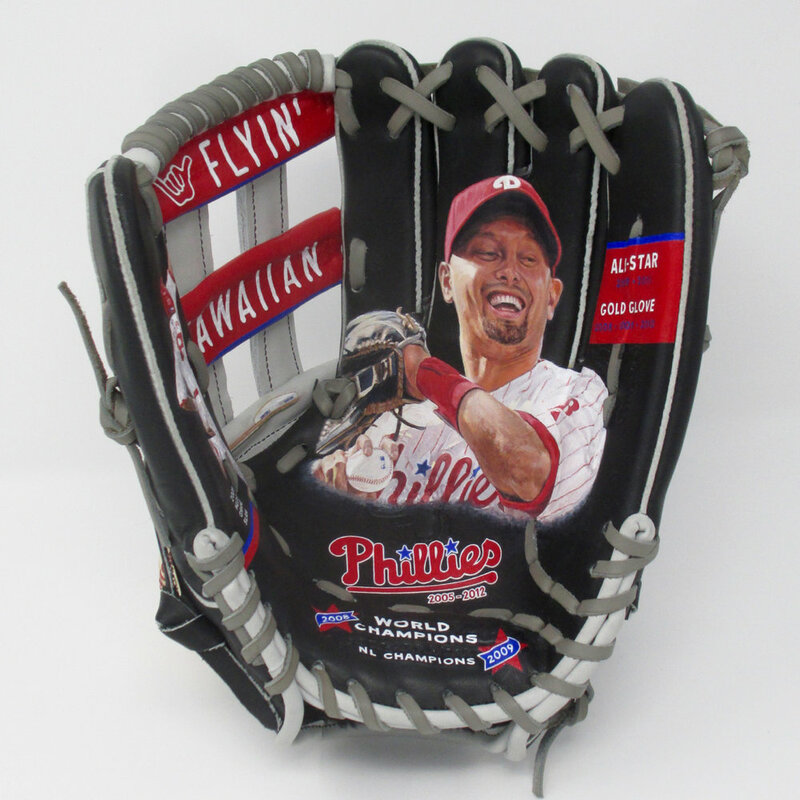 For this painting commission, the Phillies chose photo references and sourced an Akadema baseball glove just like the one Shane used in the outfield. The painting was created with acrylic paints and on an Akadema outfielders glove. Once the team selected from a variety of designs I presented using photos they chose, work began on preparing and painting the glove. This included hand-lettering of text, Phillies logo and portrait painting. The tight space in the glove required chopping the brush handle in half so I could fit it and my hand in there to paint. This is my fourth painting for the Phillies. 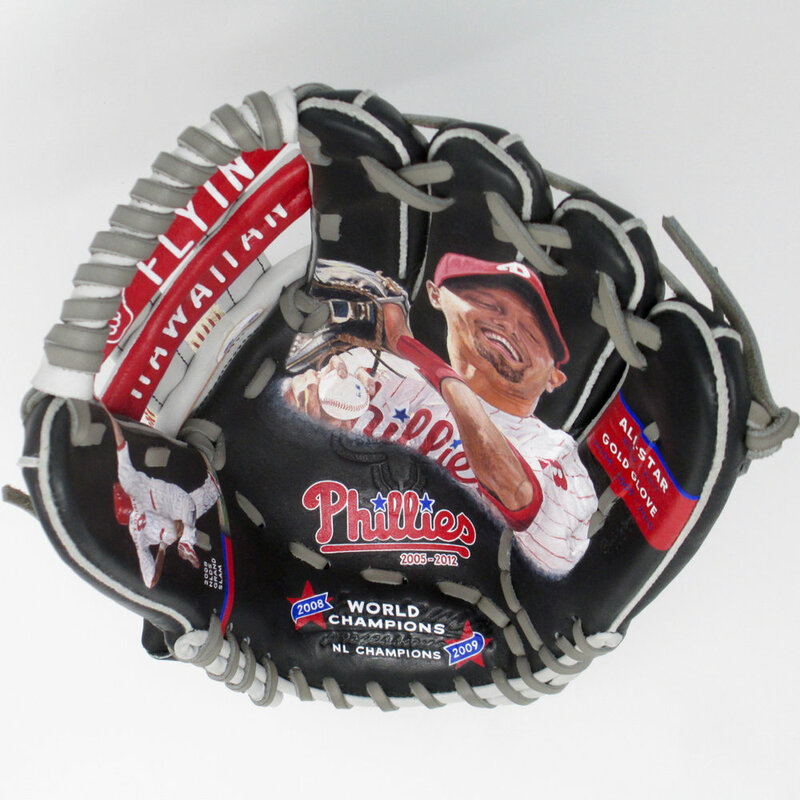 Previously I painted catcher "Chooch" Ruiz, a glove for Ryan Howard, which was also presented in an on-field ceremony at Citizens Bank Park, and painted base for Jim Thome. Thanks to the Phillies for partnering with me to create this special gift and here's to Shane enjoying this keepsake artwork for years to come. His glove paintings have been featured on ESPN.com, NBC Sports.com, and MLB Network Radio. Glove art has helped fundraising efforts of the Cal Ripken, Sr. Foundation and the Milwaukee Brewers Fantasy Camp.